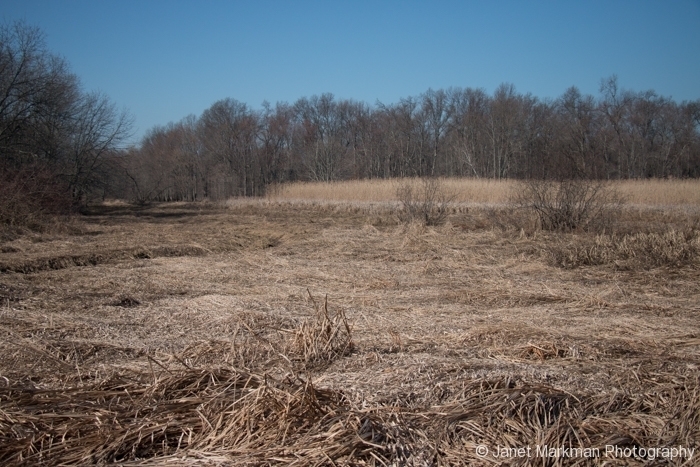 Hatfield Swamp is nestled in between the towns of West Caldwell, Roseland and Fairfield in Essex County, New Jersey. This particular area that I enjoy exploring, has received quite bit of attention earlier this winter, most notably because of the Painted Bunting (Passerina ciris) that was spotted there this past December and January. This bird has not been seen since the end of January 2016, after that huge snow storm that dumped two feet of snow on New Jersey. Let’s hope the Painted Bunting safely migrated south. 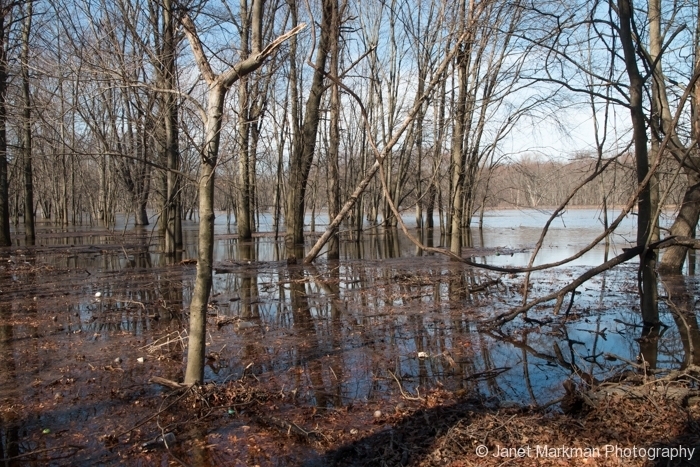 Hatfield Swamp is a freshwater forested wetlands, with scrub-shrub habitat, that lies within the flood plain of the Passaic river which floods several times a year, due to heavy rains and snow. 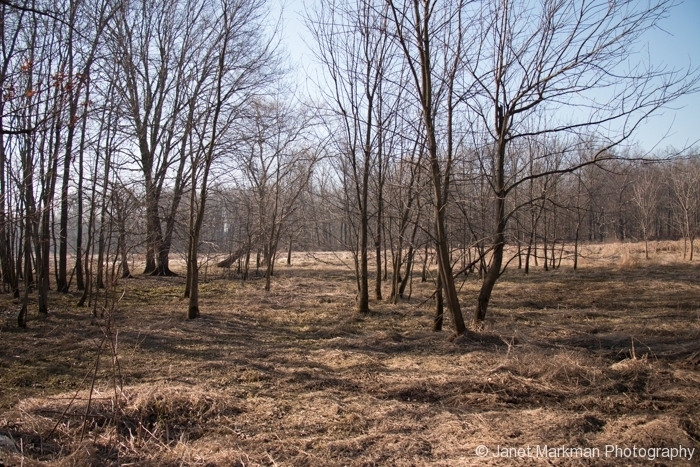 Hatfield Swamp is an ideal habitat for breeding, wintering, and migrating bird species. On an historical note, the swamp is named after the Hatfield family who owned and operated a mill before the American Revolution. But since the Hatfields were loyalists, their land was confiscated and sold to the Crane family. This past winter I have been spending quite a bit of time at Hatfield Swamp where you can see quite a bit of biodiversity. Bird species commonly seen in the winter include Woodpeckers, Blue Jays, Cardinals, Chickadees, Tufted Titmice, and a variety of sparrows. Almost all these birds, with the exception of some of the sparrows, are year round residents who congregate in mixed flocks during the winter months. This mixed flocking behavior is a survival strategy that reduces the risk of predation through increased vigilance, that is, more eyes that can spot predators and sound an alarm call, allowing for increased foraging efficiency. Predators include Hawks which can be seen flying overhead, especially Red-tail Hawks (Buteo jamaicensis), Cooper Hawks (Accipiter cooperii ) and Sharp-shinned Hawks (Accipiter striatus). Several woodpecker species including Pileated Woodpeckers (Dryocopus pileatus), Northern Flickers (Colaptes auratus), Red-bellied Woodpeckers (Melanerpes carolinus), Downy Woodpeckers (Picoides pubescens) and Hairy Woodpeckers (Picoides villosus), can be found in Hatfield Swamp. Downy Woodpeckers (Dryobates pubescens) can often be spotted boring holes in the phragmites and using their long agile tongues to find hibernating insect larvae. 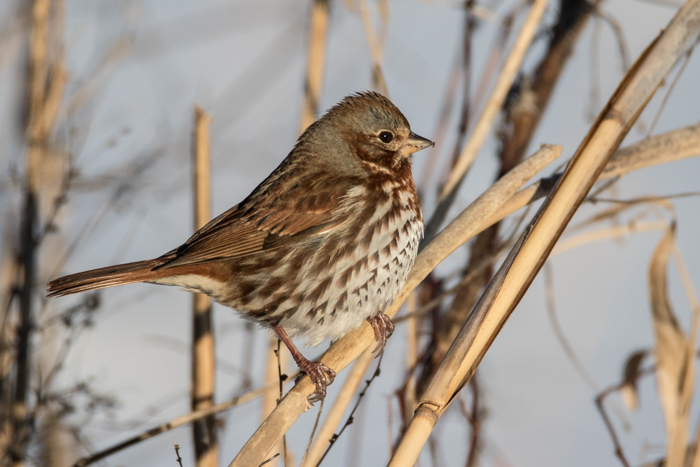 Sparrows, such as the Fox Sparrow (Passerella iliaca), White-throated Sparrow (Zonotrichia albicollis), American Tree Sparrow (Spizella arborea) and Dark-eyed Junco (Junco hyemalis ) spend their winters here and migrate North to Canada in the spring to breed. On my bird walks, I often see mixed flocks of sparrows on lower branches of plants or on the ground foraging for seed. 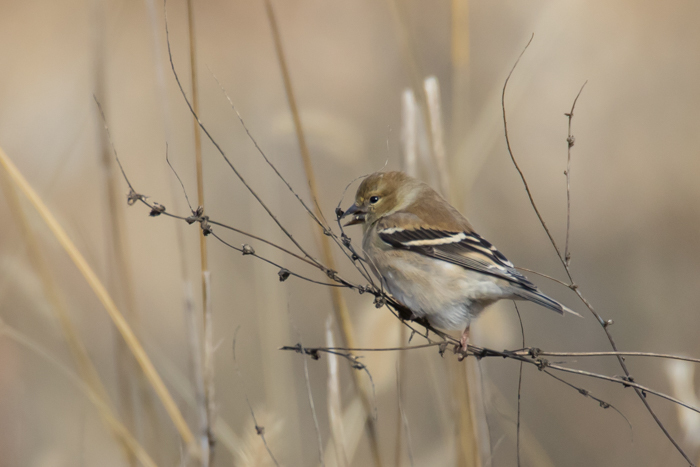 Flocks of American Goldfinch, the New Jersey State bird, as well as Robins have been seen in Hatfield Swamp feeding on seed. 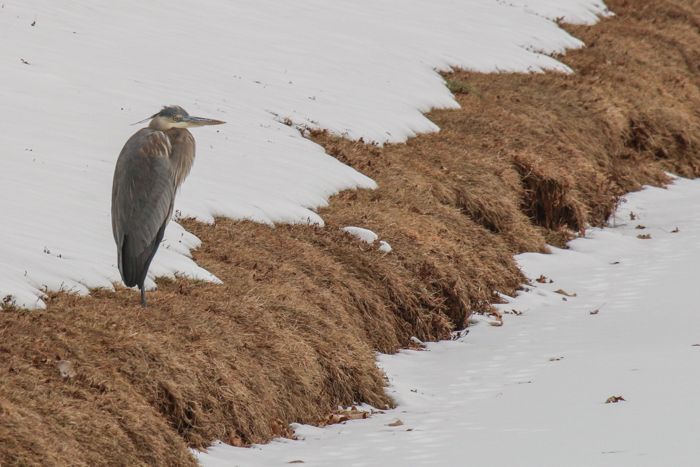 There was even a Great Blue Heron (Ardea Herodias) that overwintered here in Hatfield Swamp, and who often can be seen feeding in the pond behind Cranes Mill on the edge of the swamp. 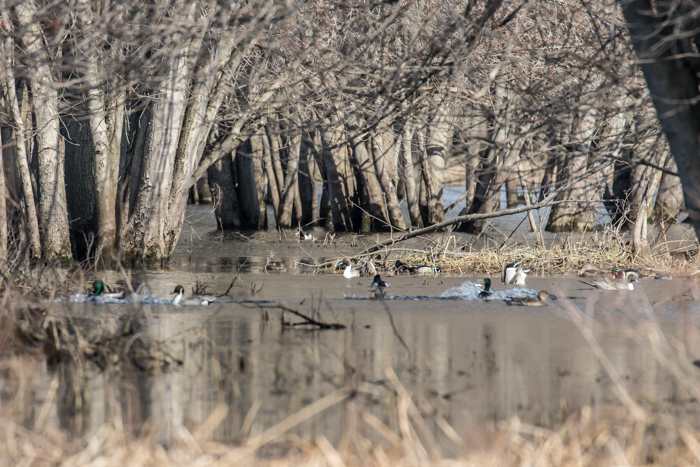 Ducks, such as Mallards (Anas platyrhynchos), Black Ducks (Anas rubripes), Northern Pintails (Anas acuta ),Wood Ducks (Anas platyrhynchos) and Ring-necked Ducks (Aythya collaris , just to name a few, can often be found during the months of February and March. These ducks will happily inhabit any open water they can find. Open water is plentiful when we have a mild winter, like we did this year. But during severely cold winters, the Swamp often freezes over. 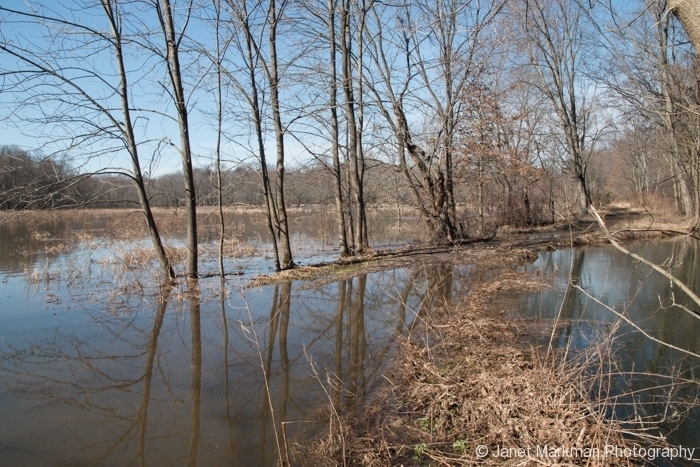 The Mallards and Wood Ducks will breed right here in Hatfield Swamp, whereas the other species of ducks will head north to Canada to breed in the spring. 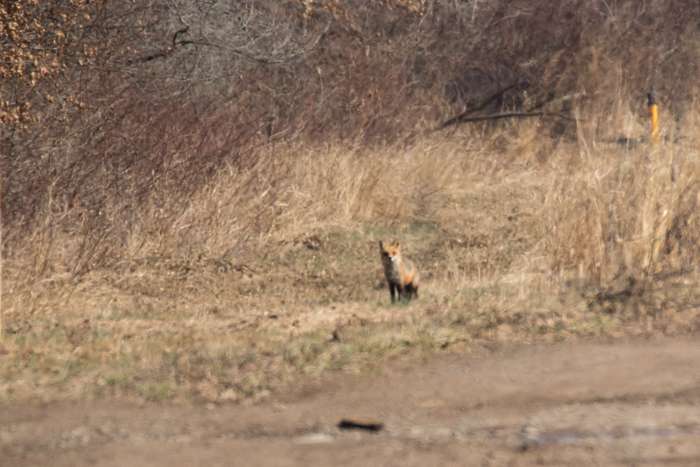 On several occasions I even caught a glimpse of a red fox (Vulpes vulpes), but as soon as the fox was aware of my presence it quickly darted out of sight. In late winter, I spotted the arrival of the male Red-winged Blackbirds (Agelaius phoeniceus) staking out their territories and awaiting the arrival of the females. The winter months provide lots of exciting stuff to see – if you know where to look. Stay tuned for more of my nature adventures, like my upcoming trip to Florida, and my observations during New Jersey’s spring migration, in late April and May. Hi Janet- Have been reading your interesting blog on Hatfield Swamp- How nice to spotlight like this- your comments about its suitability for migrating birds are nice to see. I learn something every time I come to your site! 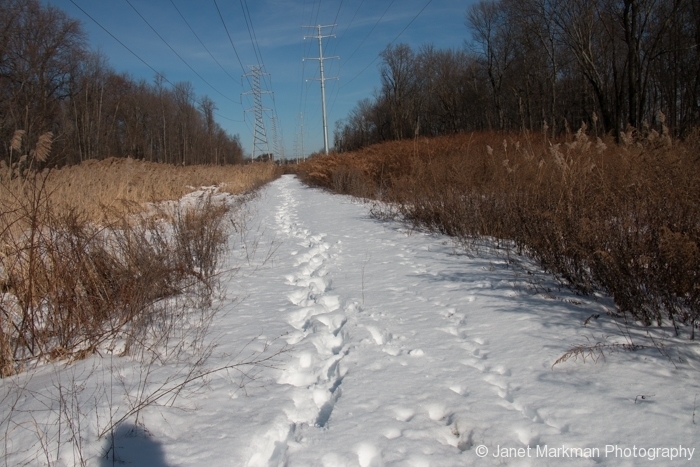 We have lots of natural places in New Jersey, that I look forward to visiting and sharing. We are fortunate to be on the Atlantic flyway so we get to see a lot of migrating birds in our area. Besutiful appreciation.of nature. Don’t Great Blue Herons mograte south anymore. We had a recurring pair in the Huddon River Valley snd theydif. I have seen them in FL in the winter. Most Great Blue Herons do migrate South, but as long as there is adequate food sources some Great Blue Herons have made this area their year around home.